CORRECTION: This piece was originally posted yesterday, March 17, but please rest assured: The movie is actually happening tonight, March 18. Sorry for any confusion. Howdy. Senior Writer Jason Heller here. The A.V. 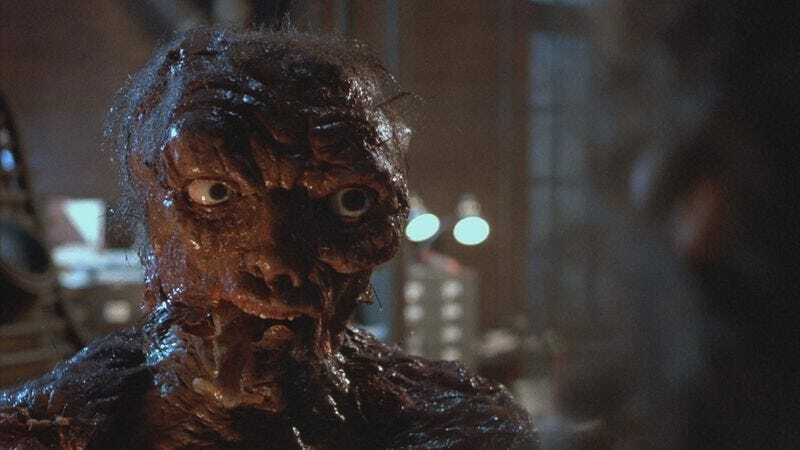 Club’s Science Friction film series—which is curated and hosted by yours truly and Denver Comic Con cofounder Frank Romero—continues tonight at 7 p.m. at the Alamo Drafthouse Cinema Denver with The Fly. David Cronenberg’s grotesque, chilling 1986 remake of the ’50s sci-fi-horror classic will be shown in glorious 35mm. It’s all part of Transformations Month at Alamo Denver. What could better? As always, Frank and I will be on hand to introduce the film (along with our special guest co-host, artist and filmmaker Daniel Crosier of Thoth Engine Productions), and we’ll pick the winner of our monthly giveaway—in this case a copy of Chris Nashawatay’s lavish coffee-table book Crab Monsters, Teenage Cavemen, And Candy Stripe Nurses, courtesy of Abrams Books. One last thing: On April 2, Frank and I will be launching a second monthly film series at Alamo Denver. It will be called Fantastique, and it will be devoted to fantasy films, and it will be sponsored by The A.V. Club, and we are so stupid crazy excited that we might just wet ourselves, especially since we’re kicking things off with nothing less than Highlander. In 35mm. Haggis will be served. Bagpipes will be present. Again, I am not even kidding. Tickets for The Fly are available right here.